Organizing for your personality can be the key to implementing order at home. (RealSimple.com) -- Whether you're innately tidy or not, find strategies tailored to how you think. So why not use this information when implementing order at home? It could be the solution to the endless search for the right organizing gear and offer relief from the disappointment (and cost) of failed attempts. "The key to successful organizing," says Melissa Picheny, principal of declutter+design, a functional-design company in New York City, "is to pay attention to your personality. Then come up with a plan that conforms to it, rather than trying to work within someone else's system." Which side do you think with? If you're not sure whether you're left- or right-brained, here's a quiz to give you an idea. Read each statement and note which ones apply to you, then consult the key. Our lefty- and righty-inspired solutions for keepsakes, jewelry and photos are on the pages that follow. 1. When I'm finished using an item, I put it away immediately. 2. I love being surrounded by vibrant colors. 3. Whether I'm looking at a work of art or a room, I tend to prefer symmetrical design. 4. I like to move around my furniture a few times a year rather than stick with the same arrangement. 5. I'm the go-to party planner for friends and family. 6. Keeping current projects where I can see them is a must. 7. I love having a designated spot for each item in my closet or drawers. 8. On my computer, I often have multiple windows open at once. 9. I have a specific morning routine that I always follow to a T.
10. When making major purchases, I usually follow my instincts rather than do research. 11. I often wear the same jewelry every day. 12. If I have to explain directions to someone, I'll draw her a map instead of telling her verbally. 13. When I find a great dish at a restaurant, I order it every time I go there. 14. I often drive with the Empty light flashing. 15. I always bring a shopping list to the grocery store. 16. I have a lot of knickknacks around the house. 17. My books and CDs are in order, so I can always find what I'm looking for. 18. My desk is filled with piles of papers, sticky notes, and business cards. 19. I feel guilty if I don't follow the rules while playing board games. 20. I'm fine with other people making last-minute changes to plans. Key: Count up the odd and even numbers you've circled. More odd numbers? You're a left-brainer. More even? Welcome to the right-brain club. Equal split? You're a mix and can benefit from organizing systems designed for either type. You tend to crave designated locations for everything. Because you like to sort, options with compartments can be especially satisfying. Left-leaners often prefer to keep things out of sight, so boxes that stack nicely in drawers or closets are appealing. Categorizing by date or event comes naturally, and multiples of identical storage options (say, matched photo albums) feed your urge for extreme order. Forget about trying to adhere to strict rules. Your keep-it-neat plan should capitalize on your pull toward the creative and the emotional. Containers you already own and love can be motivating. 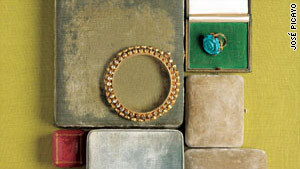 Investigate your clutter patterns: Do you drop your necklace on the bathroom counter when you're getting ready for bed? Maybe you need a wall hook by the sink to catch jewelry. If it works for you, it's correct. Varied in shape, keepsakes can be a headache for the neatnik. Think in terms of matched containers (your usual preference) in different sizes for the just-right fit you crave -- one for letters, one for theater programs, for example. Inexpensive divided boxes with depth let you sort ephemera (matchbooks, seashells) and stack it all nicely in a drawer. Divided acrylic trays play to the left-brainer's love of customization, providing the option to subcategorize (one tray for rings, another for necklaces) or implement a plan that speeds up a morning routine (accessories that are worn together stored in a row). All pieces are easy to locate, and earrings stay with their mates. High-frequency trays can stay out, while others can be stashed in a dresser drawer. Boxes with photo labels are great for single-subject sorting (one for each child, say). They can hold discs, too, so you can unify your digital and print collections. Flat archival boxes protect larger prints and vintage photos. Small albums are perfect for individual trips or events. Where to buy: Small handled clear case, $13; and Library flat file, $10: containerstore.com. Kolo Noci Mini photo albums (with ribbon), $13 each, aifriedman.com. Clamshell-lid negative/print storage box, $13.25; and glassine envelopes, $14 for 100: universityproducts.com. A memento collage above a desk lets you bask in memories. Start in the center of a bulletin board with a bright piece and build out, creating a dense but relaxed grid. Funky boxes, like those here masquerading as vintage books, hold 3-D items. Found containers (chocolate tins, gift boxes) catch random objects, like ticket stubs, and glass shows off shells. Where to buy: Apothecary bottle and cork, $2.25 (sold separately)thesage.com. Antiqued Secret Hideaway books, $32 each, threepotatofourshop.com. You're prone to tangles and forgetting what you own. A display keeps everything visible and knot-free. Hang jewelry from elegant insect pins on a foam-core board that's been covered in velvet and framed. (Pushpins stuck into a small bulletin board are fine, too.) A bust can hold a special necklace (or five). Flip over a glass and perch a bowl on top for rings and pins. Where to buy: Thalia marble sculpture, $425, store.metmuseum.org. (Find more busts, from $13 each, at statues.com.) Insect pins, $9 for 100, the Evolution Store, 800-952-3195. Load pictures into bright boxes (which are easy to spot), and buy some scrapbooks. (Stash decorative tape, photo corners, and labels nearby.) When you have a few minutes, stick a couple of photos into a book, jotting down the corresponding memories. Use broad themes, like "kids" or "parties," so there's no pressure for detailed sorting. Where to buy: Gustav box, $12, organize.com. Soho Photo Boxes, $15.50 each, katespaperie.com. Telescoping stand/card holder HomArt, $36, areohome.com. Tape, $34 for 10 rolls, happytape.com.